Miller Spectrum® 375 X-TREME™ plasma cutter has 30 amps of cutting power to cut mild steel up to 3/8" thick and the flexibility to go anywhere. The Spectrum® 375 X-TREME™ with the new XT30 plasma torch is the only plasma cutter its size with X-TREME™ cutting power and technologies for X-TREME versatility. X-TREME™ Versatility - Auto-Line provides state-of-the-art flexibility to the end user. The Auto-Line circuitry automatically connects to 115/230 VAC, single-phase power, 50/60 Hz, without removing the covers to relink the power source. No longer is there a concern if you have the correct machine for the shop or job site. X-TREME™ Portability - Portable in the shop or at the job site - at 18 lb the shoulder strap allows the end user to easily move from location to location. Miller's exclusive multi-voltage plug (MVP) allows connection to 115 or 230 V receptacles without tools, choose the plug that fits the receptacle and connect it to the power cord. LED indicators for pressure, power, cup and temperature allow faster troubleshooting, eliminating unnecessary downtime. NEW! Auto-Refire™ technology provides ultimate customer convenience by automatically controlling the pilot arc when cutting expanded metal or multiple pieces of metal. The pilot arc will switch in and out as fast as needed when cutting expanded metal and provides maximum power for cutting thicker metal - all automatically! No need for manual re-triggering which reduces user hand fatigue. Ergonomic design XT30 torch with increased comfort, safety trigger, and improved flexible cable. NEW! Automatic air regulation automatically compensates for input pressure variation to provide constant recommended torch pressure for optimum cutting performance. LVC line voltage compensation provides peak performance power under variable conditions (power fluctuations up to 15%) for steady cuts and cleaner ending cuts. 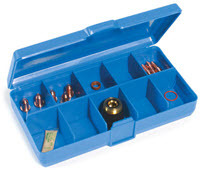 FREE #253520 plasma consumables kit ($114.85 MSRP Value). Genuine Miller Plasma Consumable Kit for your Miller XT30 or XT30C plasma torch ONLY. Suitable for use with Miller Spectrum® 375 and Spectrum® 375 X-TREME plasma cutters equipped with the new XT30C or XT30 plasma torch. PLUS get a $200 Build With Blue™ Cash Rebate from Miller® with the purchase of a Spectrum® 375 X-TREME™ plasma cutter AND get up to an additional $200 Cash Rebate when you purchase qualifying Miller® or Hobart® branded accessories (excludes welders and plasma cutters). Download Build With Blue™ Rebate Submission Instructions HERE. All rebate forms MUST be submitted electronically to Miller no later than July 15, 2019. Offer expires 6/30/19. Genuine Miller replacement Multi-Voltage plug adapters for your multi-voltage Millermatic® welder, Miller Maxstar® welder or Miller Spectrum® plasma cutter. Miller Spectrum 375 X-TREME Plasma Cutter w/XT30 Torch 907529 has a pilot arc. Does the 375 xtreme come with a filter? Do I need any kind of air filter before connecting the air supply to the plasma cutter? Do you sale just the carrying case for the plasma cutter? If not where I can find one at? Does the torch shut the air off until use, or does the air run constantly? The air will only be activated once the trigger is pulled. 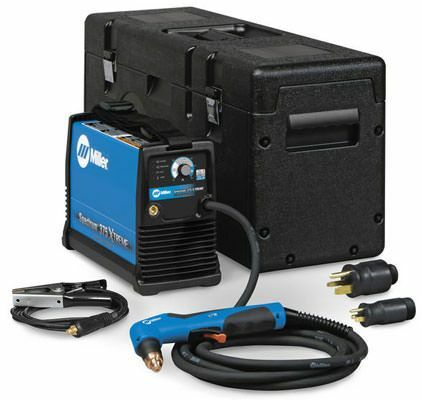 The Miller Spectrum 375 X-TREME Plasma Cutter w/XT30 Torch 907529 will pull 3300 Watts and 30 Amps at the highest. As long as your generator can accommodate that, you should not have any issues. Do you need to hook up an air regulator with the 375 x-treme or is the pressure regulated by the automated regulation in the unit ? The Miller Spectrum 375 X-Treme Plasma Cutter will regulate the air pressure within the machine. Miller indicates that there are no special tricks or procedures for cutting 1/8 ' aluminum with a Miller Spectrum 375 X-TREME Plasma Cutter w/XT30 Torch 907529. Will it cut Boron,High strength steel and Ultra high strength steel? Will I need a compressor to make simple cuts in angle iron and 1/8 to 1/4 mild steel? The Miller Spectrum 375 X-TREME Plasma Cutter w/XT30 Torch 907529 must have an air supply to operate. You will need a air compressor to do any cutting.. I am also looking at the Hobart AF500i, and they look to be about the same price. Can you please provide some comparison / suggestions. Thank you. If I buy the XT30 consumable kit at the same time would I qualify for the $150 Build with Blue rebate? Can the 375 X-Treme be setup for CNC? What size breaker is recommended to run this machine? Is the carrying case included? what kind of air source will i need ? Will this unit pierce 3/16" carbon plate steel and what is thickness capacity for stainless steel? The Miller Spectrum 625 X-TREME Plasma Cutter w/XT40 Torch 907579 can pierce 3/16" carbon steel when running on 240 volt AC. it will pierce 1/8" carbon steel when running on 120 volt AC.. Miller indicates that when cutting stainless , aluminum, or any other materials with a high thermal conductivity that cutting capacities will be reduced approx 30%. The max thickness capacity for stainless would then be 17/64" or approx 1/4"
What is the electrical service requirement (240V/? ?A) for this plasma cutter? thanks. what is the difference between the XT30 and XT30C torches? Where is the 375 X-TREME made? I want to use this in the field. What is the minimum size welder/generator needed to effectively run this plasma cutter? Does it have a built in air compressor? If not what specifications would the air compressor need? The Miller Spectrum 375 X-TREME Plasma Cutter w/XT30 Torch requires a compressor that can provide 5.0 scfm @ 90psi..
the 375 needs 90psi @ 5.0 cfm, my portable job site compressor is rated 90psi @ 4.2 cfm. What happens when the compressor can't keep up with the airflow demand? Does the cutter not work? Does the quality of cut suffer? Will it damage the machine? Could I just wait for compressor to recharge then resume cutting? does this new unit have it's own built in air compressor ?? The Miller Spectrum 375 X-TREME Plasma Cutter w/XT30 Torch 907529 does not have an internal air compressor. What are the warranty terms for this product? Miller Spectrum 375 X-TREME Plasma Cutter w/XT30 Torch 907529 offers a 3 year warranty. what kind of gas can be used with the plasma cutter? Yes, you can cut rusty metal with a Miller Spectrum 375 X-treme plasma cutter. You may just have to clean part of the metal in order to get the arc started. Straight out of the box..
Top notch product from a top notch company. I'm a reseller, and I had a customer in a bind and needed a plasma cutter asap. I called Cyberweld and they shipped it out that day. He couldn't have been happier and the Miller works awesome! ProsFast service, great pricing, top shelf product ! Miller does not disappoint. Works as advertised and CyberWeld made the my online purchase easy. Will definitely do business with them again. Very impressed by customer service and on time delivery. Product was shipped day after I ordered it and was at my door a day after that! Plasma cutter is everything that I expected it to be. Unbelievably clean. no flash marks at start of cut! Very nice machine. The Miller 375 xtreme plasma cutter worked great on the first try with no problems. ProsUnit is lightweight and does what it was designed to do. Great Plasma Cutter. Preformed just as I expected. *And the same can be said about "Cyberweld" bought big items here before and with the same results. And will look forward to my next purchase @ Cyberweld. "Keep up the great customer service." ProsVery Easy to use. Not much to set up. Small lightweight but has more cutting capacity than the model it replaces. Quieter, more versatile, quality torch and better ground strap than before. Comes with a few extra tips, carrying case is heavy duty. Interchangeable plugs a big plus. Very happy at this time. Just added Spectrum 375 to my family of Miller welders and accessories. This plasma cutter is typical of all Miller products. Top notch! Great light weight cutter! Have only played with it a little bit but works great. Cyberweld is also a great company with great prices to do business with! Called my local dealer and they couldn't come close to the price. I'm very pleased. ProsLight weight , cuts great . ConsThe strap they send with for a handle isn't the greatest idea I've ever seen , but it works , looks to me like a handle on the top would be better. The case could be changed to keep the cord from binding would be good . I have just started to use this product and so far it is great. 5 stars to Cyberweld. Great experience. The perfect match to my small prerunner fabrication shop. Amazing cuts compared to my old thermal dynamics plasma. Miller looks fantastic and the size is unbelievable! I believe Miller fixed the carrying case I did not notice the cord being smashed when it was in the case! Quality as always from Miller! I needed a plasma for my home shop and this little gem truly fits the bill. It cuts up to 3/8 steel and 1/4 aluminum with ease. The carrying case is nice but it does kink the power cord right at the machine as there's not a lot of room. Miller is the best, between this and my millermatic 252 my home shop is equipped nicely. ConsCase is good but could be better. Cuts great and looks to be well built. Extra consumables included in case was nice surprise. The shipping was extremely fast. The plasma cutter works great. Like the fact I can use it with 110v or 220v. Very compact, quiet and easy to use quiet. So far so good with the plasma cutter. But, this really bummed me out. Miller went to such great lengths to design an awesome tool but their case, which I want to use to store my plasma cutter is terrible. The electrical wire sticks out the back of the machine and right against the side of the storage tool box. Could cause major damage to the tool. No biggie, I ordered a cart but I would not use this case to transport my cutter. Really really bummed, such a nice box otherwise. This is some major screw up from the designer of this box. Miller should fix it and send us all out new ones for what these cost. ProsCuts like butter. Very handy little machine. CYBERWELD... PRO...PRO...PRO... will only buy from them in the future. Thank you CyberWeld. ConsStorage box is useless for the cutter. And there is a ton of room. It's just the the cutter sits so close to the end of the box that the electrical wire has to bend at a sharp 180... looks like if you kept it in the box long you would ruin your wires. use the box for something else. Hate to be picky but these are expensive and that part of the box was a bad design, Miller needs to step up and fix it. Maybe actually try the cutter in your prototype box before you mass produce it. One last gripe, no handles on the top. They give you this terrible nylon strap. Does not work. I've already slipped and grabbed the adjustment dial by accident. Again, little thing, cutter works awesome and is worth the price... but Miller need to work on the details... that's what we pay top dollar for. I'd expect better quality in the accessories. Works fantastic. Saved me $200 over my local dealer and arrived in only two days. Works great. Effortless cutting. Very pleased! HAVE ONLY USED ON A COUPLE OF SMALL PROJECTS---- VERY SATISFIED WITH CUTTING AND COPING 3" SCH 40 PIPE. ConsPOOR DESIGN FOR TRANSPORTING---- NEEDS A HANDLE NOT A CLOTH STRAP ---COME ON MAN!!!!! The product was great. Prices reasonable. Easy and quick follow through with purchase. Delivered on time. Big cutter in a small package. Pretty impressed with this little guy so far. I was surprised at how small it was - until I used it. I've been rebuilding a frame on an old military jeep and modifying it to accept a modern V6. Eats 1/8" like nothing, the majority of uses have been on .188 wall tubing. I've cut 3/8" plate with it and was surprised at the speed. My 1st plasma cutter I have used or owned. It is everything I've needed so far. I purchased this plasma cutter not too long ago and from the day I received it I have been nothing but pleased. I have it along with my Miller 180 auto set welder and it also works like no other. I work with decorative concrete and from designing to making forms has been a great experience. As they say, "Worth Every Penny", and that goes for both machines. TY Miller. Small unit with all the cutting capabilities needed for my shop. I always trust in Millers quality. Solid Unit. Much more than I expected. This unit is a hoss. I was a little apprehensive about it at first. You wouldn't think it but it has a very long duty cycle. I constantly welded a 6 foot long 3/4 inch wide fillet weld on 3/8 plate before the overheat light would shut the machine down for cooling (a great feature by the way). That was with the knob cranked to the max power. Pretty impressive. I can't imagine many instances where I would need more duty cycle. If you weld anything thicker than 1/4 I would probably get a little more machine but its good for anything up to that. A really nice, small machine. Everything right out of the box works great. easy setup, light weight. power cord, torch and ground cables are plenty long. sorry I waited this long to get one! Can't go wrong with buying blue..Love Miller products, they stand the test of time..
Haven't had it that long, but performs well. I wish I would not have put off buying it as long as I did. how can you not like this cutter. Unmatched prices and even better delivery time. I had been researching the many Chinese import models because I couldn't afford the better American product. That was before I came upon the Cyberweld web site and I discovered I could get a top of the line unit from Miller for a great price. I've not used it yet, but I've no doubt it will operate as advertised. The biggest surprise though was the speed of delivery. I will definitely buy from this place again for all my welding needs. ProsEverything about the purchase was the best. outstanding, excellent. great equipment and great service. cuts throught 1/4 inche steel like a hot knife through butter. costs more but totally worth it! easy to set up and operate. a pleasure to used after trying a couple of lower cost units. I WANT TO CUT EVERYTHING! a must have in certain instances; save the money, and buy it. Proscompact, light, ergonomic handle, versatility. This machine does everything I hoped it would do. Once again Miller has not let me down. This plasma cutter did not struggle to cut through 1/2" thick mild steel using 240v (50amp) service and 3/8" steel using 120v (20amp). I would buy this machine all over again. It is perfect for the farm or for the garage fabricator. ConsNeeds a minimum 5cfm compressor but this helps with making a cleaner cut. Everyone is amazed that this little thing, scarcely larger than one loaf of bread placed on top of another can burn through this much metal this fast. have a stripped bolt head that is bothering you? Blow it away in 1.5 seconds! Super value, Get one ! Searched the internet to find the best portable welder at the best price. Cyberweld's Miller selection and pricing could not be beat. So far, the Miller has not disappointed and works as advertised. Used the Miller Spectrum 375 to cut the saddles on some drill stem pipe used to build some heavy duty dog kennels. Cut like butter. So nice not having to light the torch every time and mess with gas settings. Great Product from Miller. ProsEasy to setup and operate right out of the box. ConsPower cord coming out of unit seems to get smashed when put in storage case. Not enough room behind unit and inside of case. This was my first plasma cutter and glad I spent the extra $$ on "Big Blue" instead of one of those cheaper brands. Like many have said, I should have gotten one of these sooner. Using the drag tip, was able to make short work of 16ga. sheet steel using an aluminum cutting guide on 120V AC. Be aware and follow Miller's recommendation for appropriate 90+ psi clean moisture free air supply. I used one of those smaller throw away inline desiccant dryers screwed to back of the machine and observed it quickly turning from blue to pink with trapped moisture. From now on, I recommend using one of the larger dryers or the plasma guard filter also sold by cyberweld.com. Also, the entire unit was transported inside the X-Case in the bed of a truck through a driving rain storm. Although the case doesn't seem to be very moisture proof, nothing got wet inside although I would be careful and not assume perfect protection in the future. I need to cut semicircles in 3/16 steel and the old way of using a portable band saw and grinder was slowing me down. This plasma cutter works great and looks great next it's big brother, the Miller Mig welder. They make a great duo! I purchased the 375 Extreme to use for light work in my small home shop. I bought the dual voltage since most cutting will been done at home and I can use the same receptacle that my wire welder uses. I probably won't cut anything thicker than 1/4" and this cutter cuts through it like a hot knife through butter. Cyberweld was fast getting the cutter and accessories shipped to me. Sent in the rebate form and I'm looking to get back 15% on an already low price. ProsCuts clean and fast. Light weight for portability! Sturdy case for transporting. Can't find a better price. wouldn't recommend using with 110 power. works but wont get full Potential. used on 220 for a month took it to a buds house used it on a 20 amp 110 circuit and was not impressed. It was great to deal with Cyberweld , They took my order and just a few days it arrived at my door step. I will be using cyberweld for more products in the future. Now its time too put my miller plasma to work. Thanks for great service cyberweld. This unit is light and very easy to move , And easy to use . And don't forget the needed filter. Has a lot of cutting power . Don't under buy a unit. Get one for the size of metal you cut the most . The Case is a must , Has a lot of room & Built heavy . Millers name says it all . # 1 . ENJOY !! And Cyberweld has a great price and very quick shipping . Great company. ProsAll positive here. Watch your power supply . If you have the power . It will do more than it is rated for..
ConsNone , Because this machine will cut every thing I need it for plus some. I was a newbie to plasma cutting when I first received this machine two weeks ago.I have since cut many things with this plasma cutter.First thing it was an easy machine to use was ready to go out of the box simple simple simple!This machine cuts well with 110 but better performance with 210.Gets hot after using it awhile and cuts out.This is not a machine for lots of constant cutting.However this is a great little machine compact and easy to use.I would recommend this machine to any home user who needs the power of a plasma cutter from time to time. Proscompact uses both types of power 110 210 cuts well up to 3/8 well and like the headline reads like butter and fast. saved me a ton of time from spot weld drilling just cut out!! Consafter about oh ten minutes give or take machine got hot and cutout thats fine time for a break anyway!! This is my first plasma . I took it out of the box, read the manual and put it to work. I sliced up an old Barden truck bumper no problem.It works great. Best price on unit I could find. Shipping was quick. Havent gotten rebate back yet but thats Miller I need to follow up with. Just got it today went home and tryed it out easy set up and easy to use. Look forward to using it ,cut 3/8 steel plate with no problem. This is one of those tools that you put off getting for years. Now that I have it, you realize how dumb you were not to get it long ago. 2nd piece of Miller equipment and 3rd purchase from Cyberweld. I rate both as excellant. I had been waiting for almost ten years to purchase a plasma cutter, and I don't know why I waited. This is the best tool that I have for fab now. It cuts out hours of work. If you think you need one, don't wait. ProsClean cuts, easy to use, and I am able to pick between 110 or 220 on the fly so I can cut anywhere. CyberWeld delivered ahead of time and on price! I have not used the unit yet, but by order was processed and delivered early and in perfect order. This works great. Don't know how I ever worked without one. Cyber weld is a great company to do bussiness with. ProsEverything, nice clean cuts, easy to change parts and just keeps working. I'm a sculptor and using this item to cut the shaped sheet metal. I'm happy the result to cut thin pieces but for steel plates can not say the same thing. It's slow and not so clean cut. I can say for sheet metal cutting it's good for steel plate cutting not good. Generally I like Miller's products and have also stick welder and using it for 7 years happily. Thank you Miller for making good quality products. ProsGood quality with good price. I expected great quality in my purchase of a Miller plasma cutter and that is what I got. After ordering a Miller welding helmet from these folks earlier in the year and being very happy, (1st purchase from Cyberweld), I decided to try them with te purchase of the plasma cutter. The price was the best, shipping was fast and when I discovered that a portion of my order was missing, they immedately shipped the missing item. I will reccomend them to my friends and will order from them again. ProsLives up to expectations and then some. This was my first experience using a plasma cutter. It took a little practice to get the cutting down but once that was handled all go. We found that you could cut metal thicker than was stated. Great machine for shop and saves time. The unit is portable and lightweight. One thing keep the tip close to material as suggested and also look at Miller web page videos. Pictures show us working on a Mud Truck. I have yet to use the plasma cutter because I am waiting on an air compressor purchase from another company. I did not receive an email order confirmation when I ordered the cutter and I did not receive a shipping notice when the cutter was shipped. These would have been nice (because ordering stuff on the web can be a bit risky) , but I would definitely purchase from CyberWeld again.